These Open House Flags are 8' Tall so Passing Cars Can Read the Message! A Portable Design Allows Realtors to Take The Blade Banner to Every Property Showing! Each Open House Flag Has Bright Bold Coloration! 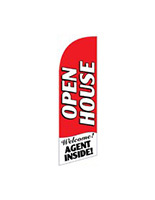 Open house flags come with a nylon carrying bag for transporting. Ground spike base for set up in the front yard of a property. 4-Piece aluminum and fiberglass pole makes these flags affordable. Polyknit fabric is designed for outdoor use. 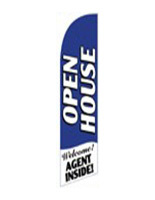 These open house flags with red lettering provide real estate agents with a quick and portable way of promoting showings! Not only are these pennants easy to carry, but this message feather banner is one of the most affordable models on the market! Why are these open house flags that are pre-printed more affordable than similar outdoor displays offered by competitors? The inexpensive price point is primarily due to the use of an aluminum and fiberglass pole, as well as a pre-printed design. These swooper open house flags, also known as feather banners, break down into pieces that fit into a compact carrying bag, which is included with purchase. 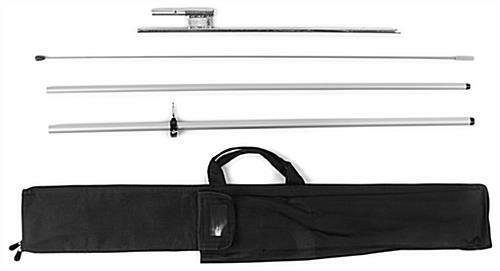 Separate compartments for each section of the aluminum pole, ground spike and banner keep the components organized, and prevent the aluminum tubes from clanging together while in transit. Open house flags that are portable set up in less than a minute. A cord attached to the blade banner connects to the pole in order to ensure the pennant does not fly off. 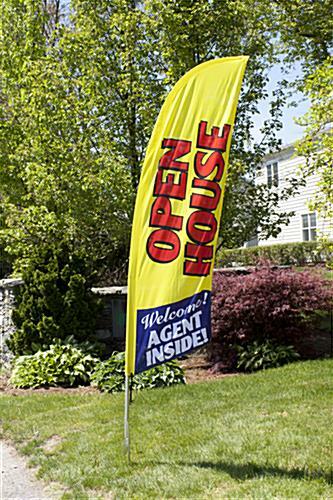 Open house flags are just the display needed for realtors trying to sell a property in an oversupplied market. Small yard signs often are not even noticed by potential buyers, but these swooper banners virtually guarantee everyone will know a home or apartment is open to the public. A red on yellow color scheme ensures these open house flags will stand out in the busiest of environments. Furthermore, the "Welcome! AGENT INSIDE!" 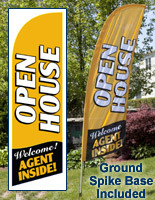 message under the main text of the open house flags creates a welcoming atmosphere to drive traffic into the property. 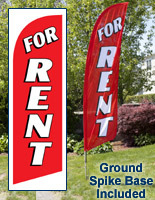 Once placed on the ground spike, the feather banner is approximately 8' tall, while the pennant measures 24"w x 72"h. These open house flags that have a ground spike must be set up on a grassy surface, as only a ground spike base is included with purchase. 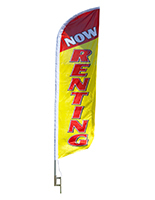 Buy other message blade banners in the series to create an even more impressive outdoor display, which is sure to attract the attention necessary to rent, lease or sell your property! Please Note: These banners are not for use in winds exceeding 10 mph. 18.0" x 96.0" x 14.4"